On Sunday, Evernote and Honda teamed up to host its first design and build hackathon in Silicon Valley. 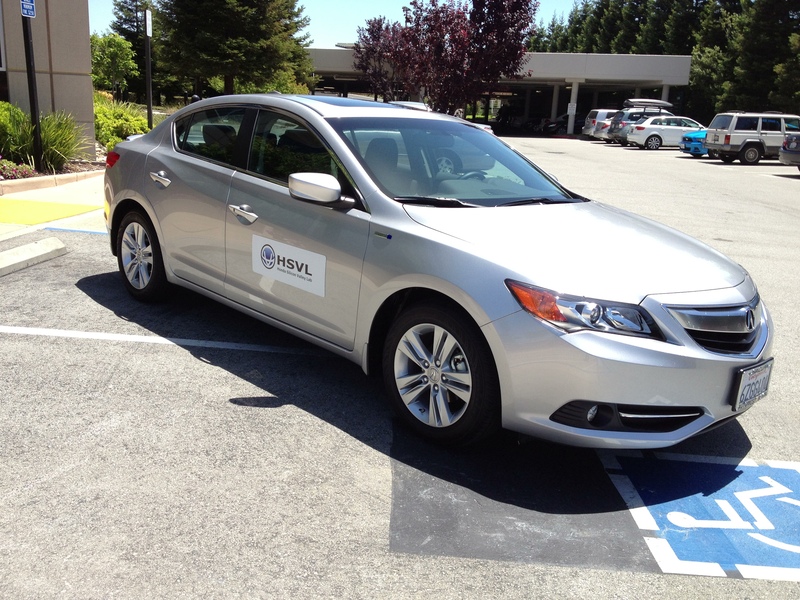 With noteworthy prizes on the line, developers were encouraged to come up with interesting hacks that not only used Evernote’s API, but also one of several others, including the Honda Silicon Valley Lab (HSVL) API for smart cars. 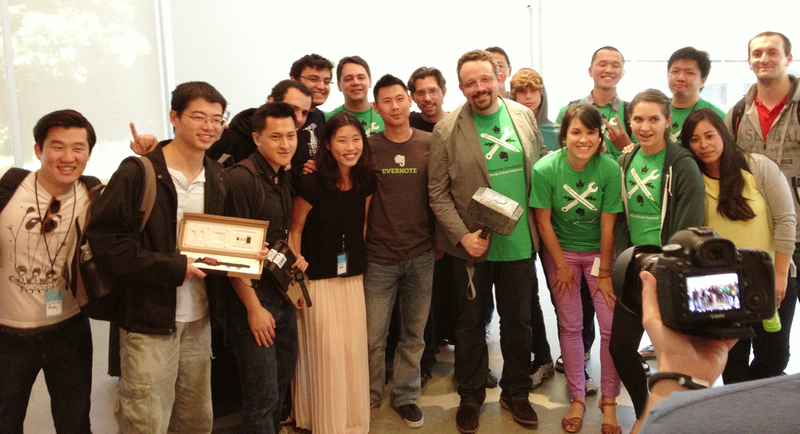 We attended the three day event at Evernote’s offices and here are the winners. Although the company has hosted many hackathons around the world geared towards both developers and designers, this was the first time in a while since the company held one in Silicon Valley. Teams worked all throughout the weekend to come up with hacks that worked with an array of services, including APIs from LeapMotion, Pebble, NODE, and the aforementioned HSVL. One of the main sponsors of the event, HSVL is a program set up by Honda to develop applications that integrate with its smart cars and provides developers with active data. Essentially, it’s meant to ensure that the car manufacturer keeps up with technology changes and foster creation of tools and apps that will help drivers better adapt technology into their driving experience. EverSpeakerNote: A service that allows users to drag and drop PDF or PowerPoint files into its website and control its presentation using the phone application. Speaker notes and images would be stored into the user’s Evernote account. Fueler: A mobile application that leverages both Evernote and the HSVL APIs to measure the quality of someone’s driving while offering achievements to promote good behavior. Alternate Reality: This application utilizes Oculus Rift, LeapMotion, and Evernote to help bring virtual objects into real life. Users can enter the virtual reality world of a 3D car garage and customize their vehicles and then take a screenshot and save it to their Evernote account. Souvenir: Another mobile app, Souvenir helps users enjoy their travel experiences better by enabling them to tell a story automatically for every photo right away. Simply snap a photo and the app will auto-detect the location and generate a title for it. The developers used the Google Places API along with Evernote. Trakgedy: This app incorporates technology from HSVL and Pebble to make it possible to track your valuables. During the demo, it was explained that if your car was stolen, you might not receive a notification from your cell phone, as it’s in your pocket. However, with the Pebble watch on and synced to the vehicle, an alert could be displayed telling you how far away your car is, where it’s going, and more. FitnessPro: This service enables users to measure their fitness results. It’s offered as an iPad-based kiosk feature for gym owners to enable members to select their workout using LeapMotion and uploading their selections to Evernote. Additionally, it will have an iPhone app that lets users download their workout and connect it to their Pebble watch to find out what to do in the gym. The mobile app would connect to a Node device on a fitness machine to track the number of reps made. LeapYum: A LeapMotion-powered service that enables people to use their device while their hands are dirty. Specifically targeting recipes at first, the Web app allows users to scroll through different instructions while preparing their favorite meals. BeSafe: A personal safety service, it lets people summon help if they’re in a life-threatening situation. It’s integrated with Pebble and if you’re about to get mugged for your phone or wallet, you can press a button on the watch that will track your location and any audio in the area and share it with whomever you wish. It also can directly dial someone for help. Instant Upload for Evernote: A different way to take photos and upload them into Evernote automatically. Chronometry: A Windows Phone app that features a list of your tasks and tracks how long it takes to complete an item. DressMe: A fashion service, DressMe makes it possible for people to arrange their outfits using Evernote. Users will snap photographs of all of their clothing attire and within DressMe, arrange them so that they have outfits for the week. These arrangements can be uploaded to Evernote for safe-keeping. ShopShop: This service enables users to take photos of items that they like and upload them to Evernote. The key here is that the app will utilize Evernote’s image recognition software to decipher what the item is and include a list of online sites where it can be bought and arranged by price. RoadNote: Another travel app, RoadNote aims to make road trips fun again by saving key attractions like restaurants, gas stations, and other things on your journey that you can share with others later. Live Graffiti: A drawing application that uses LeapMotion. All of the hacks were judged by representatives from the event’s partners, including Evernote CEO Phil Libin, Pebble’s Growth Hacker Asad Iqbal, HSVL’s Senior Program Director Nick Sugimoto, and LeapMotion’s Developer Relations head Avinash Dabir. All awarded their own individual prizes. In addition, the company awarded a prize to the hack that used four or more of the partner APIs. Called the “Renaissance” prize, it was awarded to FitnessPro. 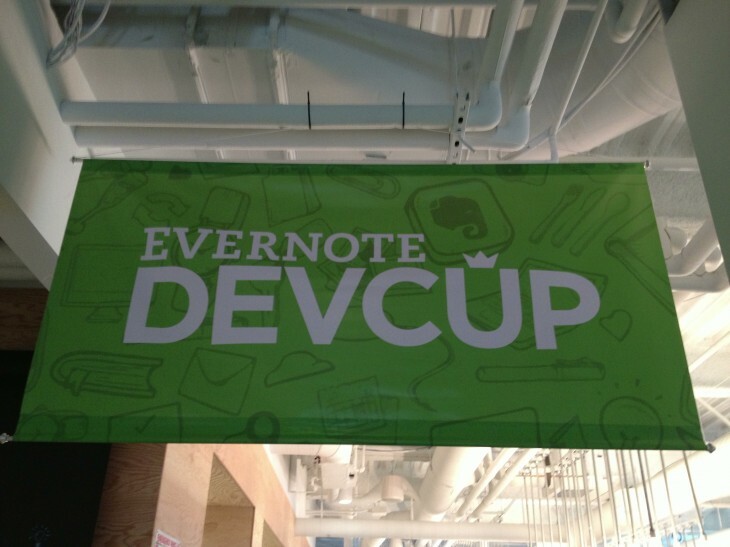 This weekend’s hackathon was part of Evernote’s continuing outreach to promote its third-annual Devcup competition. The company is encouraging developers that have submitted hacks to continue working on them and submit a more polished version to its competition for a chance to be a part of its Evernote Accelerator.